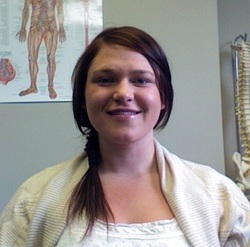 Chelsea graduated from the West Coast College of Massage Therapy in 2010. She is very eager and excited to be working along with Dr. Miller at Peak Potential Chiropractic and Kimberley Chiropractic. She grew up in Kimberley BC and spent most of her time dancing, playing sports, hiking and camping. After graduating from high school, Chelsea knew she wanted to work with people in a natural, healthy environment. The majority of her practice is Myofascial release, pain and stress reduction, trigger point therapy and deep tissue massage. She accepts all patients and looks forward to meeting you.